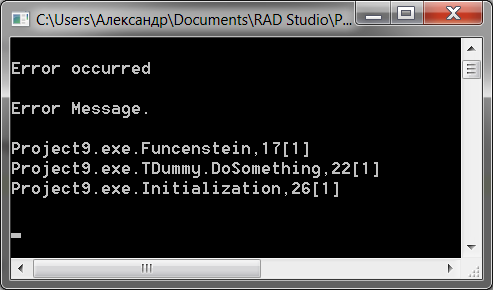 This is a wrapper for Windows.MessageBox function. It is an efficient, simple and reliable dialog type. 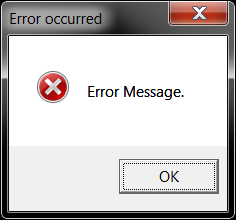 If you uncheck the "Use native message box" option - then the error message will always be displayed via Windows.MessageBox function. 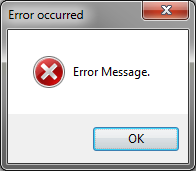 If you check the "Use native message box" option - then the error message will be displayed via EAppType.MessageBox function. What does it mean? By default "native" style is the same Windows.MessageBox function. 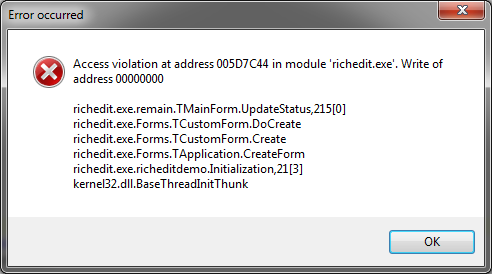 However, some types of application (currently it's a console and web) overrides this to custom routines. For example, "native" message box in console application - it's an output to console. 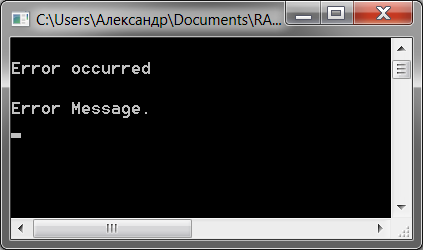 A "native" message box for IntraWeb application - it's a scripted dialog (via WebApplication.ShowMessage). 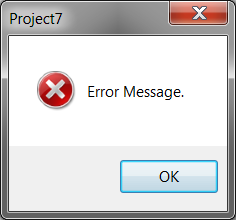 Message box type dialog is never ask user for e-mail or "steps to reproduce". The default behaviour is to store empty "steps to reproduce", use default user e-mail and send screenshot, if it was created (specified in send options). Default user information is extracted via GetUserEMail, GetUserFullName and GetUserName functions. You can set default user e-mail by calling SetUserEmail function. If you setup report sending and enable "Ask user for send consent" option - then message box will ask user for their consent before sending bug report to developer - by showing question "Do you want to send report" and presenting "Yes" and "No" buttons. 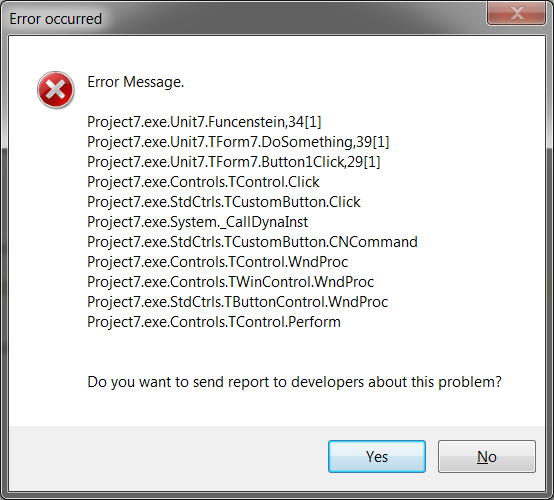 Default choice is selected by enabling/disabling "Default choice: send report" option. If this option is checked - the default choice is "send the report". If this option is unchecked - then the default choice is "do NOT send the report".